Alcan had its beginnings in Shawinigan, Quebec, where hydroelectric power facilities had earlier been developed. The first primary aluminum in Canada was produced on October 22, 1901. The operation was then a subsidiary of Aluminum Company of America (Alcoa), the pioneer producer on the North American continent. Alcan's first smelter was built in Shawinigan, Quebec, at the turn of the century. The Canadian operation was incorporated in 1902 as Northern Aluminum Company, but in 1925 its name was changed to Aluminum Company of Canada, Limited. It was also in 1925 that the rights were acquired to develop the Chute-�-Caron and Shipshaw power sites on the Saguenay River, some 241 kilometres northeast of Shawinigan. To utilize the massive and largely unused hydroelectric potential of the Saguenay � Lac- Saint-Jean region, the Company built and started its second aluminum smelter in 1926 at a new town called Arvida, today part of the city of Jonqui�re. 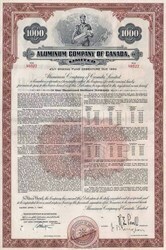 Two years later, in 1928, Alcoa decided that it should divest itself of its principal subsidiaries outside the United States, including Aluminum Company of Canada, Limited, and transfer them to an independent Canadian company that could focus its activities on the development of the industry in Canada and internationally. The separation was achieved by transferring such subsidiaries to that new Canadian company and issuing the shares of the new company to the Alcoa shareholders on a prorata basis. The directors and management were independent of Alcoa from 1928 onwards; a final adjudication of legal proceedings in 1950 ensured that any common identity of major shareholders in the two companies was also removed. Despite the adversities of the Great Depression of the 1930s, the newly independent company pursued its mission of developing aluminum fabricating activities in Canada, the U.K. and Europe that could provide outlets for the ingot from its Canadian smelters. Although the Company worked hard and successfully to develop new uses and markets for its metal in Canada, close to 85% of its smelter production had to find export markets. An international chain of sales offices was established. Also in the pre-war period, the Company was involved in pioneer efforts to build the industry in India, Australia, China and Japan. The outbreak of the Second World War in 1939 brought unprecedented demand for aluminum in the manufacture of aircraft for the military efforts of the allied nations, particularly Canada, the U.K. and, later, the U.S. To meet the demand, Alcan rapidly completed several additional hydroelectric sites in the Saguenay � Lac-Saint-Jean region of Quebec and was able to increase its annual smelter production more than five-fold to over 500,000 tonnes. Fabricating plants to produce sheet and other components for aircraft were also rapidly built in Canada and the U.K. Following the war, growth in civilian demand, aided by aggressive product development by the aluminum industry, required further expansion of Alcan's power and smelter capacity. As a result, hydroelectric projects were started in Quebec and construction began for the Kitimat-Kemano project in British Columbia. Power capacity was doubled in the 1950s and, by the end of the 1960s, Alcan's Canadian smelting capacity had also doubled to almost one million tonnes. The Company's fabricating capacity was also greatly increased and had spread to many countries, including the U.S. market where Alcan entered as a major fabricator after 1960. In the 1970s, new smelting operations were opened in Australia, the U.K., Brazil and India. In addition, new bauxite mining activities were undertaken in Guinea and Brazil, while the Company participated in new alumina production capacity, notably in Jamaica, Australia and Ireland. In the 1980s, the Company took advantage of a major restructuring in the international aluminum industry. Through the 1982 merger with The British Aluminium Company plc and the 1985 acquisition of most of the aluminum assets of Atlantic Richfield Company in the U.S., the Company substantially increased its presence in markets for fabricated products. Pursuant to a reorganization in 1987, Aluminum Company of Canada, Limited, which had been the principal subsidiary, became the parent company of the Alcan Group of companies and changed its name to Alcan Aluminium Limited. By the late 1980s, the LME had become a mature, liquid market for primary metal. Then came the global recession, the flood of exports from the former Soviet Union and the commodity price squeeze of the early 1990s. The Company undertook a divestment program with the sale of non-strategic downstream businesses in Argentina, Australia, Brazil, Canada, New Zealand, the United Kingdom, the United States and Uruguay. Alcan also restructured its holdings in Japan and the rest of Asia, reinforcing its strategic markets in Southeast Asia and China. During 1998 and early in 1999, Alcan acquired majority control of bauxite operations in Ghana and of diversified operations in India. Furthermore, in line with its strategy of concentrating on downstream, large-scale fabricating operations, Alcan reduced its holdings in Japan. The Company sold its alumina refining operations in Ireland and in Guinea, a chemicals operation in Canada and a piston business in Germany. By mid-year, Alcan announced its plans to acquire aluminum rolling assets in South Korea, followed by the sale of its building systems business in France. The dramatic decline of the LME aluminum price, in the late 1990s, had forced the aluminum industry, and Alcan, to revise corporate priorities and organizational structures as it had done earlier in the decade. Aluminum, symbol Al, most abundant metallic element in the earth's crust. The atomic number of aluminum is 13; the atomic weight is 26.9815. Properties and Occurrence Aluminum is a lightweight, silvery metal. In contact with air, aluminum rapidly becomes covered with a tough, transparent layer of aluminum oxide that resists corrosion. Aluminum is never found as alone but commonly occurs as aluminum silicate or as a silicate of aluminum mixed with other metals. Expensive to refine, these silicates are not useful ores. Bauxite, an impure hydrated aluminum oxide, is the commercial source of aluminum and its compounds. A low-cost technique dating from the 1880s is still the major method of production. Uses Aluminum weighs less than one-third as much as steel. Its high strength-to-weight ratio makes aluminum useful in the construction of aircraft, railroad cars, and automobiles, and for other applications in which mobility and energy conservation are important. Because of its high heat conductivity, aluminum is used in cooking utensils and the pistons of internal-combustion engines. Because of its light weight, ease of forming, and compatibility with foods and beverages, aluminum is widely used for containers, flexible packages, easy-to-open bottles and cans, and aluminum foil. Aluminum's resistance to corrosion in salt water makes it useful in boat hulls and various aquatic devices.